This is a friendly reminder that you can cancel your license plates online. As long as you have one of your physical plates, you can complete a no-fee transaction and print out a Plate Return Receipt once the transaction is completed. The plate return receipt is important, as it will allow you to cancel your insurance, as well as provide proof of when you took your vehicle off the road. Please note, if you do not have at least one plate in your possession, or if you have reported your plates as stolen, you must fill out a Affidavit For Cancellation of Registration for Lost Plate(s) and either bring the form to a branch office, or mail it to the address on the form. 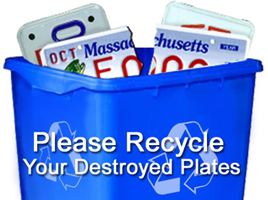 To begin the license plate cancellation process, visit the RMV’s website and begin their online plate cancellation form.